Farmers’ markets can be a great substitute for going to get fast food because you know exactly where the food is coming from. Another bonus is you get to see the producer face to face. It is also a great activity to do during the summer months because often there is live music and you’re helping your local farmers when purchasing your fresh fruits and vegetables. For those who don’t go to the farmers market often, here are some tips to ensure you make the most of your time and leave with all the right foods! Bring cash – Typically, there will be some vendors who do accept credit cards or check, but cash is always the one currency that will ensure you can get foods from any of the booths. Have a set limit of cash so you don’t get carried away, but don’t be afraid to bring a few extra bucks for those impulse buys. Go at beginning or end of day – Knowing when to go to farmers market can make a big difference in the quality of foods you find as well as the price for those foods. Going in the morning when it first opens can help guarantee you get the freshest foods available. Alternatively, consider going during the last hour of the day so you can get discounts on any of the remaining products. Vendors want to go home empty handed, so this bodes well for a bargain when the market winds down for the day. Take a lap – When you first arrive at the market, take a lap around before making any purchases. That way, you know all the foods available and can strategize the best way to spend your money. Keep an open mind – When visiting the different booths, don’t be afraid to ask for a sample if there’s something you’ve never had before. This allows you to try new food, before making a purchase. Ask questions – The vendors should know everything about the food including; how the food was grown, if any pesticides were used, or how to prepare dishes with the food. Buy in season – While the variety at the farmers market may not be as extensive as the grocery store, the food that is in season will be plentiful and most often will be better tasting. 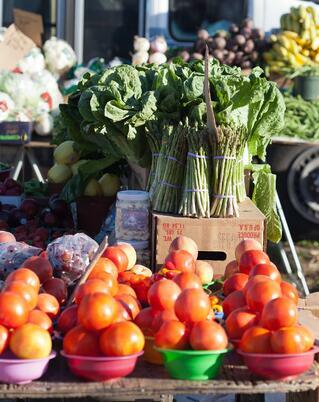 Make a day of it – Going to the farmers market can be something you really look forward to each week. There’s plenty to do and lots of new foods to try, so have some fun with it! Depending on the size of the market, you can spend a couple hours browsing for the freshest foods and often enjoying some live music. The farmers market can be a great place to discover new foods as well as find the freshest foods you already love! Start a new tradition with friends and family. It can be a great place to find those clean eating foods, sweet treats, local treasures and make a boring day not such a snore. So, go check out your local farmer’s market, support the community and have a great time!